Set in the heart of Rancho Mirage in the Coachella Valley, the 240-acre Omni Rancho Las Palmas Resort & Spa has one of the largest tennis complexes in the Palm Springs area, with 25 hard courts. When Omni bought the resort in 2014, it doubled down on that asset by bringing in Cliff Drysdale Tennis to manage the on-court operations. Tennis thus ranks as a significant lure at a resort with an abundance of other amenities to recommend it, among them 27 holes of golf, a 20,000-square-foot spa, and a kid-friendly water park called "Splashtopia." All of this is within easy reach of its guest rooms, which occupy some 30 two-story casitas—all have French doors opening onto outdoor patios—arrayed around lakes and gardens behind the historic main hotel building and its pool, a Hollywood hangout in the 1950s. The courts is a shuttle ride or pleasant 10-minute walk from the hotel at the country club. Cliff Drysdale Tennis has installed Elliot Pegg to direct. A graduate of Oxford Brookes University, in the United Kingdom, he captained the university tennis team before moving on to coaching, taking positions with David Lloyd Leisure in Ringwood and Oxford as well as tennis camp experience in the U.S. with Nike Tennis and Carmel Valley Tennis. 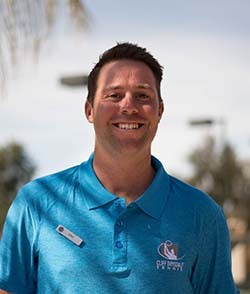 He joined Cliff Drysdale Tennis in 2012 working or directing at several resorts, clubs and camps, including Stratton Mountain in Vermont and Omni Amelia Island Plantation Resort in Florida, before taking on the Director position at Omni Rancho Las Palmas. He inherits a program that focuses on two-day and three-day camps, drawing individuals, couples, and small groups. These three-hour camps consist of two hours of group instruction each day supplemented by a private lesson. Those wanting more can take advantage of their game arranging service—a major focus, though they do charge $25 for the service and associated court fee—either with guests or local members, the latter of whom number about 200 in high season. During spring break and over the major holidays, he adds junior activities, including camps. There are Drysdale Ladies' Retreats during selected weeks of the year, and many special events surrounding the BNP Paribas Open in the spring. It also hosts several national championships each year. A raised patio off the pro shop and above the sunken stadium court guarantees a crowd of tennis players hanging out, especially during the mornings. There is a swimming pool and spa at one end, and the adjacent golf clubhouse has a bar and restaurant. Courts & Fees. There are 23 hard courts, one of them a sunken stadium court with terraced seating on both sides. Eight of the courts have lights. In addition, there are another 6 pickleball courts. The pro shop itself is minimalist, with demo racquets, basic accessories and some tennis clothing. Court Fees: $40/hour (free from June 1-Sept. 30 for registered guests). Golf Courses. There are 27 holes in total, made up of three nine-hole courses—North, West, and South—that can be combined to create three distinct 18-hole courses. All three are distinguished by palm-lined fairways, Ted Robinson bunkers, and views of the San Jacinto Mountains and interspersed with six lakes. There are no greens fees in summer, and during that June-September period, adult club rentals are just $19, kids clubs are free. Spa and Fitness Center. Located next to the hotel, the Spa has some 50 treatment rooms as well as an outdoor pool exclusively for the use of spa guests. Within the spa is the Fitness Center, with Cybex stations, free weights, various types of Cardio equipments, and yoga classes. And ... Nothing is more appealing in the desert—especially to kids—that the vast water park called "Splashtopia." Large and centrally located, in consists of two 100-foot slides, a lazy river, fountains, sprinklers, a Jacuzzi and various other water features as well as a grill—all of it exclusively for the use of hotel guests. They occasionally screen movies there, too. And there is another adults-only large pool in the plaza behind the hotel. The basic rooms all have 450 square feet of space and differ primarily in their location and view: Lakeside, Poolside, Plaza, Vista. All have balconies or walk-out patios and come furnished with either a king or two double beds. Various suites are available as well. In addition to Splash Grill at Splashtopia, guests can dine at Bluember, just off the main pool at the hotel, which serves breakfast, lunch, and dinner of California cuisine, while the nearby Palm Cafe satisfies a need for Peet's coffee and lighter breakfast and lunch fare. The R Bar opens late afternoons and evenings for pizza and burger fare, large screen TVs, and assorted cocktails. See the website for current rates during the period you want to travel. Seasons. Year-round, though most appealing from October to May.